These fish are not really bass at all. They are impostors! Beware of cichlids in bass costumes!. There are several species of peacock bass. All have a native range in the Amazon River basin of South America. The ones found in the USA are called butterfly peacocks (cichlidae ocellaris), although the speckled peacock (cichlidae temensis) is present as well. The American contingent like tropical areas, and stay mainly around the US territories of Guam, Puerto Rico and the US Virgin Islands. However, they are becoming more evident in Hawaii and Florida. Wherever you hunt for these swimmers, they will be in fresh water zones only. You can identify Peacock Bass by the presence of three dark, vertical stripes down each side, colored fins, and a "spot" on the tail, much like a peacock's tail feathers. The name comes from the Brazilian word, pavon, meaning peacock. Some varieties have blotches in place of the stripes, so they are fairly easy to tell apart.In all the different types, the adult males have a hump on the forehead. Spawning is from April through September, with a definitive spike in May. These bass impersonators can grow to be as long as 36" and weigh up to the current world record of 27 pounds. The butterfly and speckled varieties are lumped together for record purposes. Peacock anglers will tell you that these are an exciting catch. 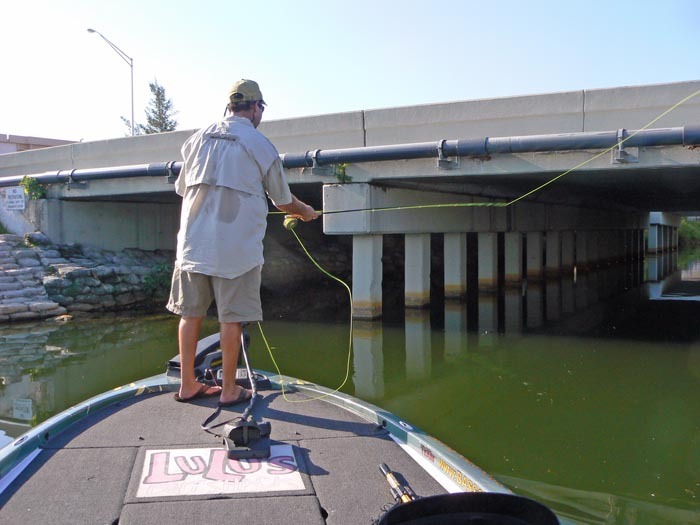 They have been known to destroy rods, reels and tackle that would normally land ANY largemouth. So yeah, these guys KNOW how to fight. You would, too, if you had to live in places where alligators, piranha and channel cats the size of small autos are the norm. So if you go after these babies, get some stout tackle, guy and girls! This fish is a voracious, carnivorous beast! They are not afraid of anything, and will prey on fish larger than itself regularly. When do they eat? Whenever they want to, that's when! 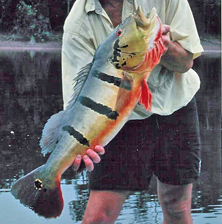 In southern Florida, around 1984, they were purposely introduced to control the invasive population of Oscars, Midas and Tilapia. Peacock bass can be prepared much like any of the ACTUAL bass(es). Take any bass recipe and substitue the peacock. The result is a delicious treat. So come on down to South Florida USA y'all, and tie on a fly. These fish have a definite resemblance to Smallmouth and Largemouth Bass. The body shapes are alike and they have the oversized mouth. However, the peacock bass is much more brilliantly colored than the bass it impersonates. The dark stripes on the sides are more evident, and the spot on the upper tailfin tell the tale. The bases are a darker green color mostly. These fish are also much more aggressive than any bass I have ever seen and will take an angler for a ride when they set the hook on one. Bass may fight well, but Peacocks will RUMBLE! !